Teachers might expect grades to be represented as points in the Gradebook, but they are currently represented as percentages. This article describes how to change the way grades are displayed in the Gradebook. 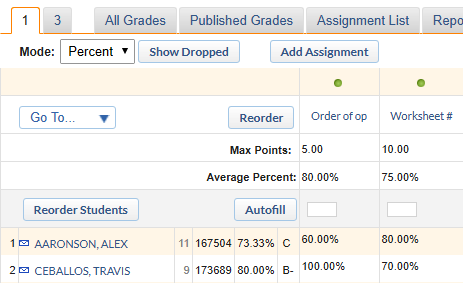 Grades are set to be shown as percentages instead of points. When the mode is set to Percent, cells display students scores as a percentage of the maximum possible score. Cells are not editable in Percent mode. When in Locked mode, empty cells are editable but cells containing scores are not. This helps to prevent accidental score changes. 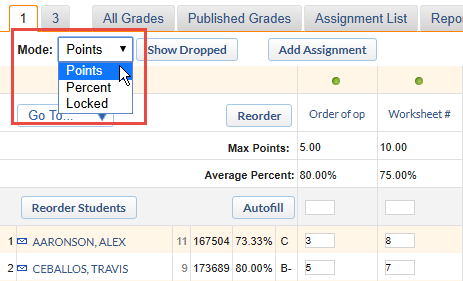 To change how grades are represented, from percentages to points, select the drop-down menu next to Mode: and select Points. 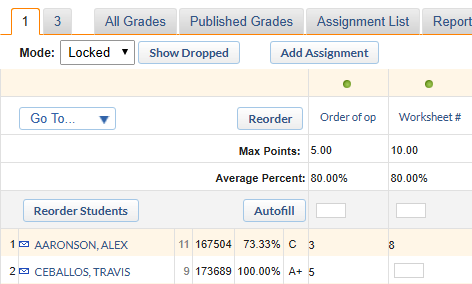 If the grade view mode has been successfully changed from Percent to Points, the Gradebook shows all grades as points.